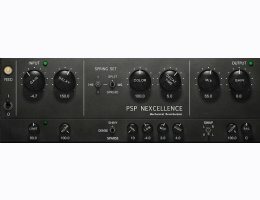 PSP Nexcellence is a rich-sounding, spring emulation inspired by and modeled after “Necklace-type” reverb units. It provides two different spring set processors and can use one or both of its processing engines simultaneously. The algorithm has improved on the original hardware by providing a handy set of parameters to let you control inherent aspects of the spring reverb. In order to run a plug-in in 30 day demo mode or activate the plug-in, you'll need an iLok user ID, which you can create for free at iLok.com, and you will need to install the free iLok License Manager application. A hardware USB iLok dongle is NOT required, however it is optional. All OS's and formats require an up-to-date (at least version 3.1.3) iLok License Manager application installed. You may download a 30 day trial demo of the PSP Nexellence plug-in HERE!